It turns out Omo's Dirt is Good campaign isn't just a campaign but a movement. 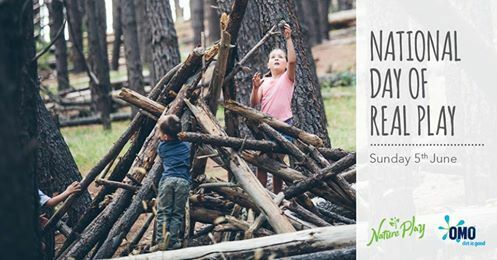 On Sunday, 5 June 2016, Nature Play, in partnership with Omo, will provide Australian children and their families with invaluable opportunities to experience nature play at its best through the National Day of Real Play. In Adelaide, Nature Play SA will host National Day of Real Play at Bonython Park between 10am-3pm. With the focus on nature play/real play, activities on offer will include kite making and flying kites, mud play, scavenger hunts, orienteering, rock climbing and building cubbies. At Bonython Park/Tulya Wodli, you will find one of Adelaide's best 'all access' playgrounds, with a kiosk, toilet facilities and ample parking (off of Port Road). Nature Play SA have stated their National Day of Play event will go ahead in rain or shine, so make sure you bring a change of clothes! The event is free - to better assist Nature Play SA with planning please register your family at this link (via Nature Play SA's website). Lots of good old fashioned fun here. Quite humorous that it is sponsored by Omo.